On July 25, 1999 I rode to China Saddle. As with many of my rides, this one started with climbing over the hill on Garoutte Road. I then proceeded up Row River, skirting around Dorena Lake, to Culp Creek. Then a right turn onto Sharps Creek Road, and about eleven miles or so to the end of the pavement. Here I again turned right, this time onto Clark Creek Road (Forest Road 23), and across the little one lane bridge. About 3/4 mile up this road I took the left fork across another bridge and onto Martin Creek Road, and onto the gravel. I've driven this section several times before (to get to the Bohemia trail), but this was the first time that I've tried it on a bike. It's not too bad. There's a little bit of loose gravel here and there, but it wasn't too difficult. After six miles of climbing I arrived at the China Saddle. This is the trailhead of the Bohemia trail. 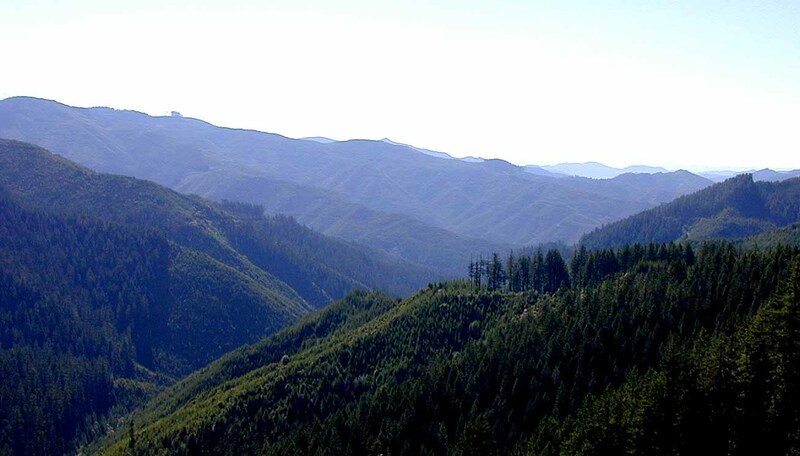 It was originally a wagon road from Roseburg to the Bohemia Saddle. It was the primary way up to the mining area before Cottage Grove became the jumping off point. After eating a small snack I headed down the Canton Creek Road (paved) into Douglas County. It drops pretty rapidly for a few miles down to the valley floor. After that its slope is fairly gradual. After about six miles it runs into the East Pass Creek Road, from Steamboat on the Umpqua River. There I turned right, and headed up the hill back to Lane County. Along the road were some nice patches of foxglove (a foreign invader! ), most the usual purple, but some white ones, and even a few cream colored ones. I saw some beargrass too, but its blooms were already gone. Up near the top on East Pass Creek Road I had this view of Fairview Peak and Bohemia Mountain. The Champion Saddle, where I had been two weeks before, is on the other side. 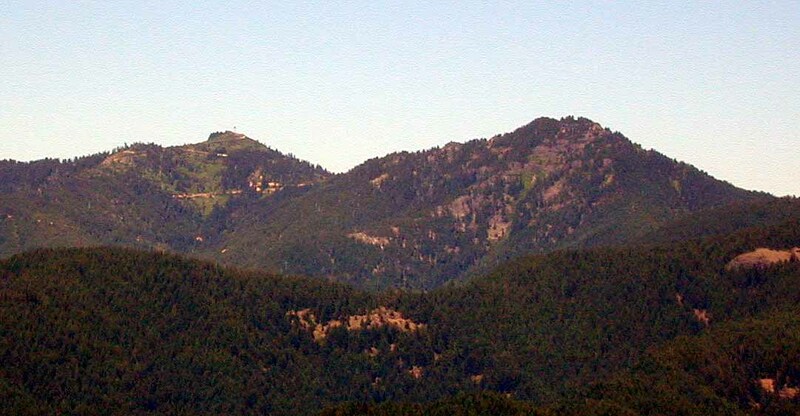 You can just make out the lookout tower on the top of Fairview Peak. About a mile further I came to Clark Creek Road and the Calapooya Divide Road. Down below is the Mosby Creek valley. The elevation here is about 3600 feet, vs. the 3200 feet at the China Saddle, also on the divide. After finishing off my snacks, I headed back down Clark Creek, and on to home. I went 72 miles, climbed about 5100 feet, and had no flats or other mechanical problems.